In this age of environmental awareness it’s good to know a favorite family holiday tradition of choosing a real Christmas tree over an artificial tree is still the environmentally sound choice. A benefit to the atmosphere, real Christmas trees absorb carbon dioxide and other gases, emitting fresh oxygen. This helps prevent the earth-warming “greenhouse effect”. One acre of Christmas trees produces the daily oxygen requirement for 18 people. With approximately one million acres producing Christmas trees in the United States, that translates into oxygen for 18 million people every day. Unlike fake trees, real trees are a renewable resource. And for every real Christmas tree harvested, three seedlings are planted in its place. Christmas tree farms stabilize soil, protect water supplies and provide refuge for wildlife while creating scenic green belts. 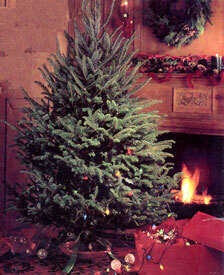 Often, Christmas trees are grown on soils that could not support other crops. Real Christmas trees are an all-American, recyclable resource. Artificial trees, most of which are manufactured in Korea, Taiwan or Hong Kong, consist of PVC plastics and metals that aren’t biodegradable and can emit toxic fumes into the atmosphere during the manufacturing process. 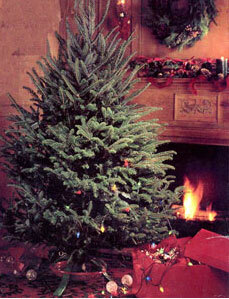 When disposed of, the artificial trees will never deteriorate. Their effects on our environment are evident and will remain for countless generations. Artificial Christmas trees may also contain lead and may shed lead-laced dust, which may cover branches or shower gifts and the floor below the tree. If you care about your health and the environment, choose a real tree for your family this Christmas.